Residential solar has two main obstacles—expense and aesthetics. Even if I could afford it, my HOA probably wouldn't allow it. All of this could change thanks to Dow Solar Solutions and their Powerhouse shingles. 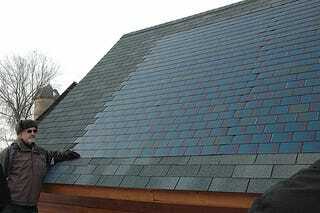 As you can see, the panels look like standard asphalt shingles—and they can be installed without any specialized knowledge. In fact, they only take about 10 hours to install on average compared to the 22-30 hours for traditional panels. Since a basic roofer could handle the job in a short amount of time, installation costs should be more manageable. Plus, Dow claims that their Powerhouse will be 30% to 40% cheaper than other solar shingle designs.